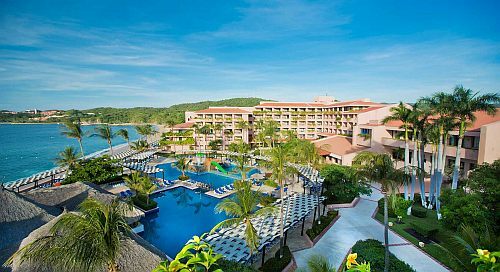 Sunwing Vacations has dropped the price of a 1 week all inclusive package (flight, hotel, transfers, all meals, all drinks) from Edmonton to the Barcelo Huatulco in Huatulco, Mexico down to $865 CAD (per person) including taxes. This price is based on a family of 4 (two adults, two children), as Sunwing is offering a discount for children aged 12 and under with this package. The Barcelo Huatulco has 4.5 circles on TripAdvisor with 43% of reviews rating it as Excellent. The Sunwing flights from Edmonton to Huatulco included with the package have 1 stop each way. Whenever you see a 'kids stay free' promotion with an all inclusive package, it's a bit of a marketing lie. You're still paying for all of their flight, and usually part of the all inclusive price as well (such as the taxes and fees). If you search for a package for just 2 adults, and then again for 2 adults with 1 child, you can see what the 'free child' is *really* costing you, by calculating the difference between the total prices. 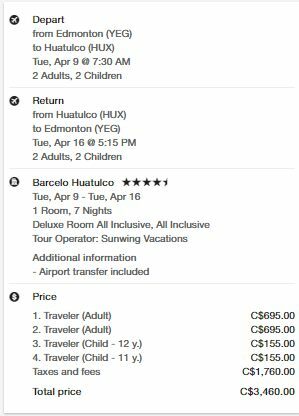 In this example, Sunwing is offering the Barcelo package for $1135/person if it's just 2 adults, and if you do all the math, you can see that each 'free child' is *really* an additional $595. So a decent rule of thumb for 'kids stay free' promotions is that for each child, you're really paying about half of what an adult would cost. NOTE: After your Expedia search completes, use the 'Search by Hotel Name' drop down menu near the top left to find the 'Barcelo Huatulco'. edmonton, yeg, all inclusive deals, mexico, huatulco, hux, north america, sunwing vacations and barcelo huatulco.